I don’t remember learning to read. The way I remember it, my mom insisted I couldn’t read and to prove her wrong, I started reading something off the Kroger sign as we drove by. From there, I never stopped. My best memories of childhood include hours of reading Boxcar children mysteries, Nancy Drew novels, and my favorite genre, horse stories. I liked setting a time goal for myself: I want to read 100 pages in an hour — I want to finish this book by 6 o’clock. Those were good days–the days filled with reading. One of my goals for 2018 was to get back to reading more. I started the year off well. I read six books in January, thanks to traveling, being sick, and a light work calendar. Even in February, the shortest of all months, I did okay, finishing four books. And then I got to MarchAprilMay (wait… is it really May?…) and my reading rate slowed. way. down. Part of it was perhaps my book selection. I started reading Lord Jim by Joseph Conrad, which (for anyone who is considering reading it) is just a difficult read. I’m enjoying it, but it took me a good fourteen to fifteen chapters to get the characters right in my mind. I am really close to finishing… and I’m really excited to finish, because I have a lot of other books to read! Finger’s crossed, I’ll have read all of these within three months! Some of these (as shown above) area audiobooks on CDs. I’m going to be taking them on my upcoming roadtrip to South Carolina, so I am sure I’ll get through at least one or two of them during that adventure! What’s on your summer reading list? Leave me a comment below to let me know! If you comment by June 14, 2018, I will enter your name into a give-away list. A comment on my blog is one entry. You can increase your chances of winning by entering via social media. If you do a summer reading list post on Instagram and follow my page (@speck.on.a.speck) and tag me in it, that’s another entry. 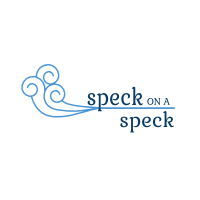 If you post to Twitter and follow me there and also tag me in the post (@speckonaspeck), that’s another entry. On June 15, I will draw a name from the entry list to select for a winner. From there I will contact the winner. You can win one of two things. Option 1 is a blind date with my bookshelf. I will send you a selection of five to six books from my shelves based on your genre/author preferences. (Don’t worry; I have more than what is shown in the picture above!) These books will be pre-loved (read: used). Option 2 is I send you the books you leave in the comment, up to $50.00 including shipping, sent to you, purchased new from Amazon. You must live in the U.S. or Canada to win the giveaway. So… what’s on your summer reading list?